Tasha's father brought an evil step-mother who wants to get rid of Tasha by sending her to a witch, even more evil, the Baba Yaga Witch. 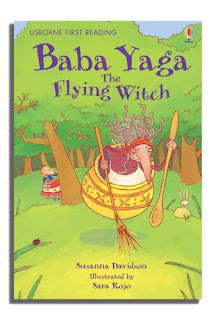 Baba Yaga lives in forest and flies around in a giant pot. Her hands are warty, her hair greasy, and her nose reaches down to her chin. How will Tasha escape Baba Yaga? This story is based upon a Russian folk tale. I would like to give you the One lovely blog award. Come and check my blog to see how you can secure this award for your blog! Oh, I need to find this one. I used to read Baba Yaga folktales as a kid. My child doesn't like scary yet though. I'm your latest follower from the picture book challenge. I like that you feature classics ect. My blog is collaborative and one of my co-bloggers reviews mysteries-- we cover the gamut-- come over for a visit and chat.